AL-88c by Alyseum is . The Alyseum AL-88c offers the same performances and main functionalities as our flagship product: the AL-88, at a very attractive price. 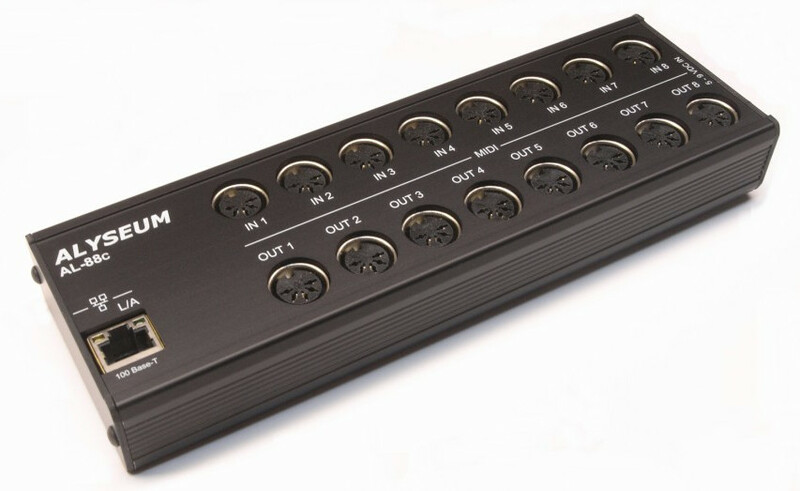 An AL-88c allows you to connect 8 MIDI In and 8 MIDI Out ports, simply and in a flexible way to patch, remap, filter and merge MIDI flows on a fine channel basis. Expandable by multiples of 2 or 8 MIDI I/O ports to create a unique patch-bay which also encompasses up to 32 virtual MIDI ports in every computer (Win or Mac OS). AL-88c offer the top performance in terms of MIDI throughput and latency/jitter far below 1 ms.
AL-88c was tested against numerous Mac & PC programs - including MIDI Quest - for a perfect handling of the touchy SysEx exchanges of past synthesizers. Self-contained interface, 8 MIDI In/Out pairs to Global MIDI Network. Wall power adaptor with AC plug for EU or UK or US supplied. 100 Base-T Ethernet port with shielded RJ45.